TICKETS: $45 and are available online at MySonTheWaiter.com or by phone at 732-246-7717. For group rates (10 or more), please call 1-888-264-1788. For more information please visit http://MySonTheWaiter.com. 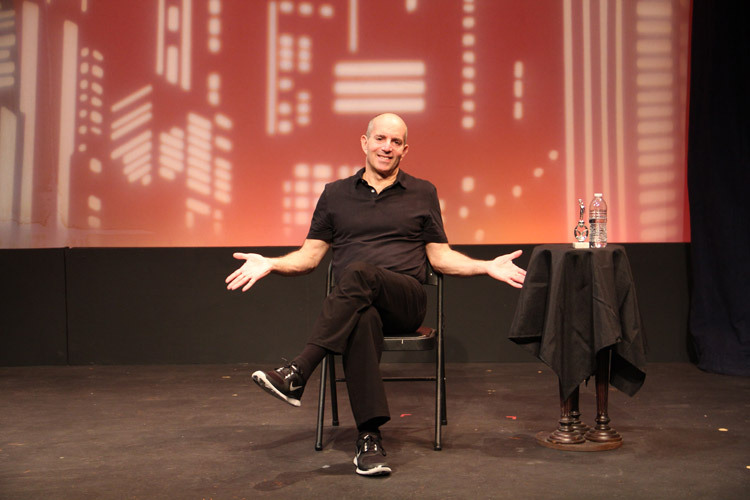 Part standup, part theatrical, My Son the Waiter: A Jewish Tragedy is the story of one man’s struggle to fulfill his dream and “make it” as a comedic actor in New York. The fact that Brad Zimmerman has put the time in to work on his craft is an understatement. He spent 29 years “temporarily” waiting tables in New York, while continuing to pursue his dream of comedic acting. In My Son the Waiter: A Jewish Tragedy, he tells the story of his journey, along with a chronicle about his childhood, family, and misbegotten love life with warmth, wit, self-deprecating humor, and wicked charm – combining his years of training as an actor with his innate comedic talent. In this 90-minute show, Zimmerman, who grew up in Oradell, N.J., also reviews the trials and tribulations of waiting on tables, particularly for someone not exactly invested in that career, and with little tolerance for finicky diners. Zimmerman worked on the script for My Son the Waiter: A Jewish Tragedy for nine years, and performed it in small venues all over the country, including a stint at Stage Door Theatre in Margate, where it came to the attention of producers Dana Matthow and Philip Roy (Respect: A Musical Journey of Women, Old Jews Telling Jokes, My Mother’s Italian, My Father’s Jewish & I’m in Therapy). Since then, My Son the Waiter: A Jewish Tragedy spent two years at Off-Broadway’s Stage 72 at the Triad Theatre in New York, and has toured the USA from coast-to-coast.